I could not take it any longer. Walking or driving to work did not work for me. My sleep pattern was affected. I was moody. My productivity remained low, and I made too many errors in my work. Today, I said to myself, to hell with it! I will cycle to the office. I did. It felt soo good. Of course all the time, while cycling I was concerned about my safety. I cannot give up cycling. I will take measures to make sure I am seen by motorists. Even though, I will look like a prat. We are making ourselves more and more comfortable in our spacious office. 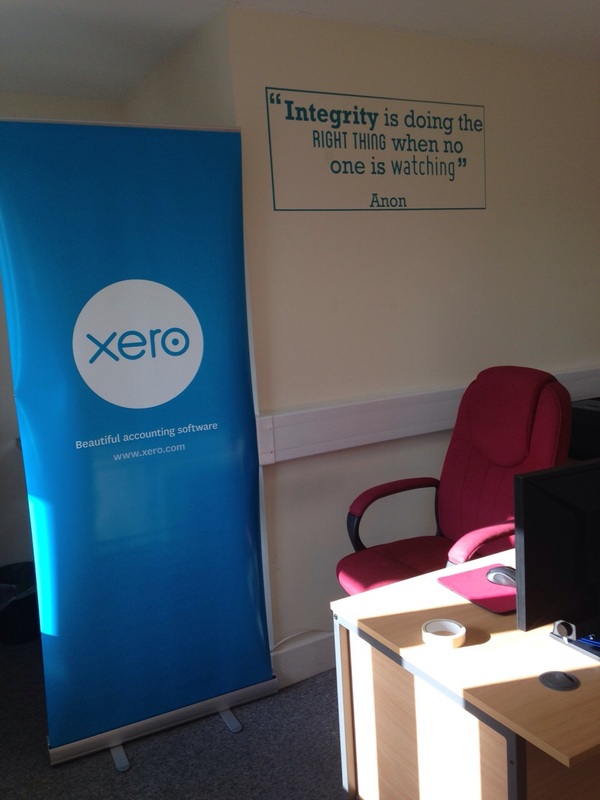 Clients and potential clients are impressed with the new office. 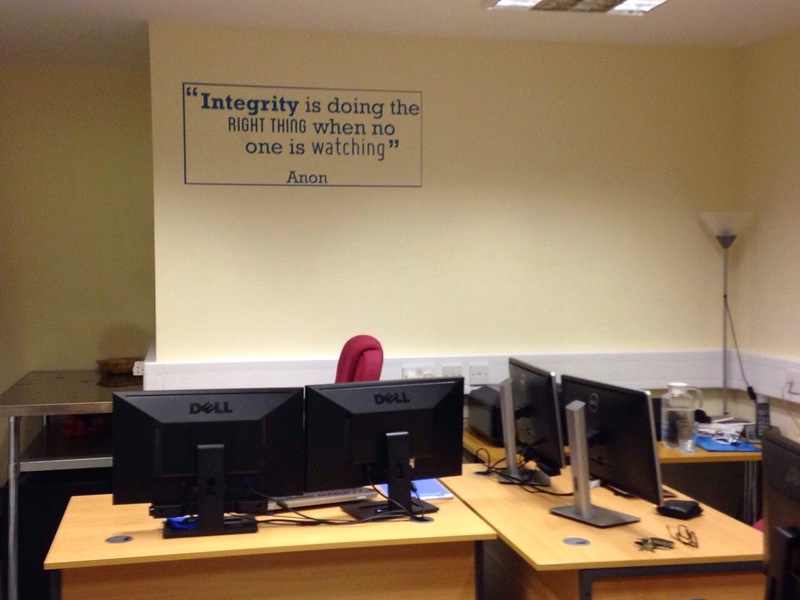 Our logo on one of the walls and a quotation on another wall adds to a business-like and a warm atmosphere we have created. For obvious reasons, I cannot share a picture of the logo. I am pleased to share the pic of our quotation. We have also created a little food preparation area that is well partition by Xero banner stand. I did not think we would use it. The plan is for us to prepare healthy lunches. We did today. One of my team members (they are only three of us!) prepared a delicious salad. I also ordered a bigger fridge yesterday; the current one is too small. I think a comfortable working environment improves staff motivation and I have no doubt it will improve our productivity. Settling in does take time and money. I think it is so worth it. Already I am feeling day by day we are more established as an accountancy practice. On my own in the office today, after my staff left, I reflected and concluded that I am doing more than just okay. I started from home on my own with a laptop and no clients. I worked from my flat for three miserable years. It was horrible. I just took the plunge and moved to an office without even looking at whether I would be able to afford it. I could not afford to work from home. I thought I had to find a way to make this work. The move to a bigger office is not any different. I did not look at the money angle. I felt it was time to move out. We need the space. Once again, I will find a way to manage it. Last weekend, I went to one of those mega stores and played around with iPad and Samsung Galaxy Note Pro. iPad is so boring! You have to stick with what you are given, and iOS is a closed system. No thanks. I bought the Galaxy Note Pro on Sunday. It is early days to give my opinion on it. One of the key learning point in my previous blog that summed up my year (2014) is a realisation how short a year is and how fast the time flies. It is important to use the time well. I want to. Think about it, we are already in February! Previous Post My Week – Please go January! Two people have contacted me asking where I bought the wall quotation. Rather than reply to each one, I thought best to provide the information here. We bought our logo and the quotation from http://www.vinylimpression.co.uk/ . I am pleased with the items. Fitting proved a little difficult for the logo. The quotation fitting was more straight forward. It was all manageable if instructions are followed.